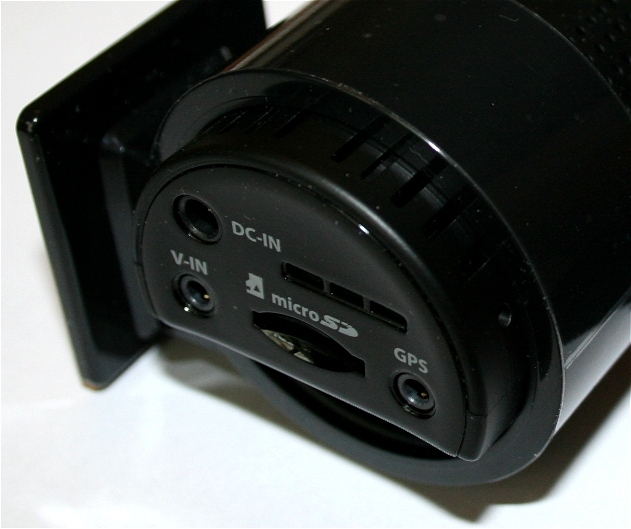 We have in our possession an MI Witness HD V2 dash cam to review. 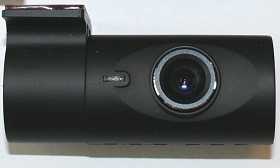 This is a two channel (or dual recording) dashboard camera which allows the owner to record from the front of the car and the rear at the same time. The HD version 2 (released Oct 2015) is designed as a natural progression from the earlier model, which is noted for its prestigious Sunday Times Best Buy Award in its own right. 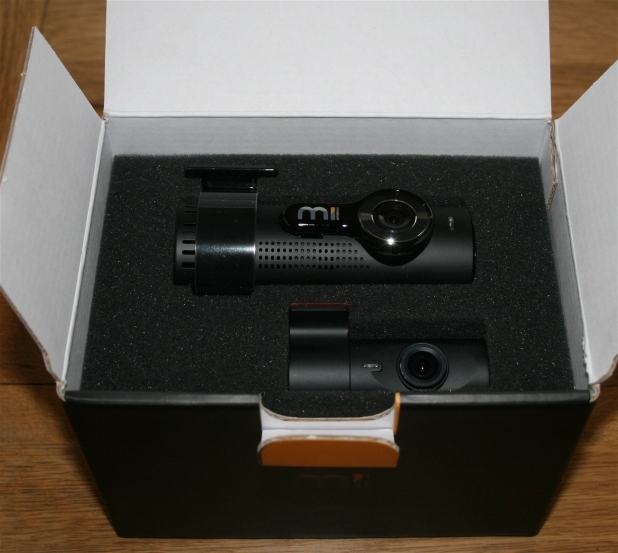 First impressions were very encouraging, with the dash cams presented in a fully branded “MI Witness” box as seen above. On opening the box, we find the two cameras, one for each channel, embedded in their protective padding. 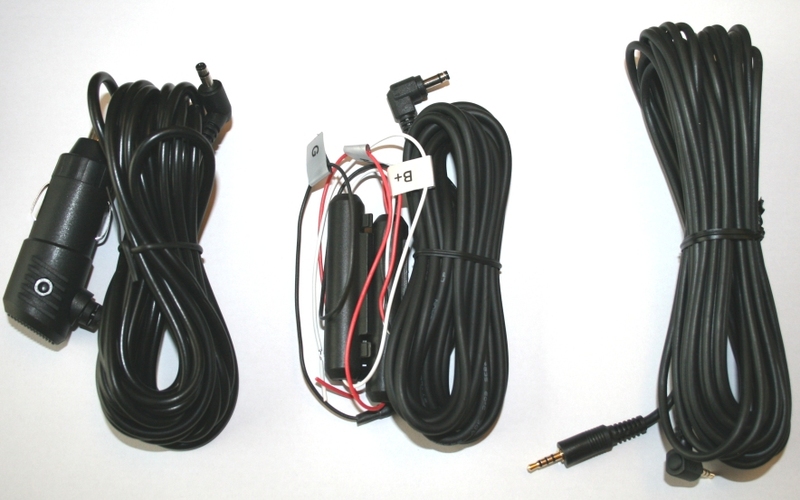 The complete MI Witness Two Channel Kit comprises of the following items – as seen below. The MI Witness Front Facing Camera. The front facing camera is clearly well built and designed in sleek black plastic and chrome. It fits firmly into a round bracket which, in turn, slides onto the GPS unit and is held firmly in-place by the four moulded grips you can see above. One end of the dash cam has all the ports on the camera. These are shown in the photograph below. (Above – on the end of the front camera, there is a DC-Input to receive power, V-IN into which the wiring from the rear camera is connected, a Micro SD port for the dashboard cameras memory card (upto 128GB supported) and finally a GPS socket for the windscreen mounted GPS box). The three rectangular holes are merely vents for cooling the electronics and air circulation. 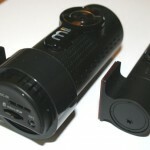 Pictured above is the side of the dash cam which faces into the car when it is mounted. On the left there are three LED indicators which are colour coded and flash, reflecting the current status of the camera when in operation. 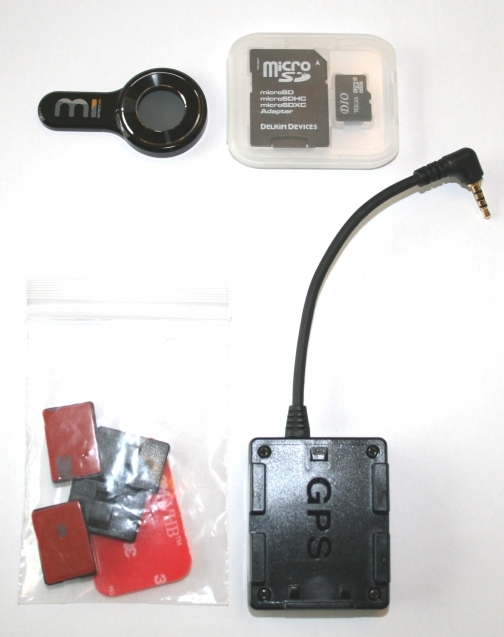 These are GPS – indicating whether or not the camera has a connection established with the satellites, Wifi – being wifi enabled the camera will display this indicator as ON when the wifi network is ready to accept a client user from an device such as an android based smartphone or Apple iPhone (the app is available for both operating systems). Finally, the status LED indicates the mode of operation the camera is running, such as RECORDING or PARKING MODE. On a camera without a built in screen (which keeps it smaller) these LED’s are essential and they work very well to re-assure the owner that the dash cam is doing its job. The bracket fits right around the camera, and is held in place by a ratchet system allowing it to spin when a small button is pressed, and then lock into position when the required viewing angle is correctly achieved. This is aided by the software viewer on the smartphone, the camera transmits the current lens view so that the owner can rotate the camera as desired into the perfect recording position whilst watching what the camera sees. This action is performed whilst the camera is in situ on the windscreen. There is one more perhaps not so minor point I would like to highlight here, over on the right of the image above you will see “Made In Korea”. 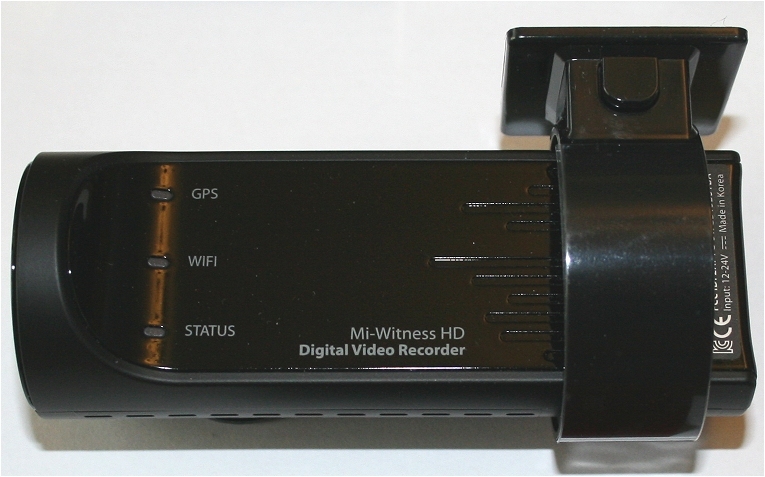 That’s correct, the MI Witness HD V2 Digital Video Recorder is NOT some cheap plastic Chinese junk you often see touted on various car camera type shops, this is the real deal and Koreans are well noted for their high quality manufacture processes and components. 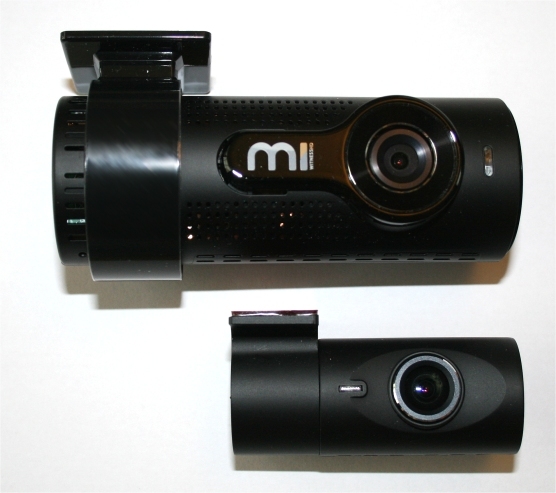 I feel this is a major selling point for this particular dash cam – and on top of that – MI are putting the cash on the table with a 3 year warranty – the highest I have ever seen on this kind of gadget. The rear facing dash cam is simplicity incarnate. It is much smaller than the front unit and it’s purpose in life is to act as a slave to the front main unit which records and stores the video footage. The camera fixes to the rear window with a padded sticky and can be rotated (thus up and down) on an internal ratcheted spindle assembly to face exactly the direction needed. Once again, the viewer app is used during the alignment process and simple press icons within the app allow the owner to switch the view which the phone displays at any given time between the front and rear with ease. The rear camera, in the same way as the front, is easily removable even once it has adhered to the glass (leaving only the holding bracket in place) and is designed this way for detaching when not in use . With this in mind, the owner has more options available to consider as to whereabouts it should be located in order that it can perform to expectations, whilst not concerning themselves regards maintaining a satisfactory level of stealth to avoid unwanted attention. The camera records footage at the same resolution as the front, that is to say 1280x720p. Many dual lens or twin channel cameras have a downgraded rear capability, but the MI kit is equal in its video specification on both cameras. The thin wire which is shown in one of the photos above runs from the side of this unit to the front camera port. This cable is 7 metres in length which is more than adequate for the vast majority of installations, and caters for routing the wire behind roofing and pillar trims. Sufficient cable is provided to extend around the circuits in most cars and also avoid particulars such as airbags which could hinder the installer if the wire is too short. These are the main traits of a great unit – and they work – unlike other units I have tested, the functions are seamless in the way they operate. For example, with the camera switched on and running, a quick press of the app icon on the phone and you are IN. There is no “this not found” or “sorry this app has stopped running” nonsense – it simply works, and this is very refreshing. Another example is the protecting of video data when the camera is under duress such as sharp cornering or an impact on collision. A separate folder is present on the memory card and the video is cropped to include time before and after the actual event, and then moved into that safe area. Older model cameras used the FAT32 file systems lock attribute to protect their important video clips, which I always felt (being a computer programmer) was a little on the – erm – budget side shall we say. In my trials / testing during producing this review, the GPS was observed to latch on within around 15 to 30 seconds of power-up which is impressive and also consistent in its performance. The last feature listed there is the car battery preservation. This is a very important feature on any device which is wired in such a way as to operate by drawing power from the 12v battery directly (via the fusebox) whilst the ignition is off. Earlier models of the MI Witness and currently all known other models of this type utilised an external power detector which would disconnect the power supply once the voltage on the vehicle battery depleted sufficiently to reach a preset level. The last thing any owner would want is the camera to flatten the car battery rendering travel impossible – this definitely defeats the object of the device! This unit has built in battery protection – there is no requirement for an auto electrician to source or fit any third party protector / own brand product to prevent the battery being drained. This, again, is a major selling point for the camera – as it makes fitting easier and there is less potential for external product failure. It is beyond the scope of this review to act as a user guide, naturally one is provided, and it is VERY comprehensive and written in an excellent standard of English grammar which is unusual to find. The booklet is crammed full of step by step instructions and also diagrams to aid in the installation and configuration. 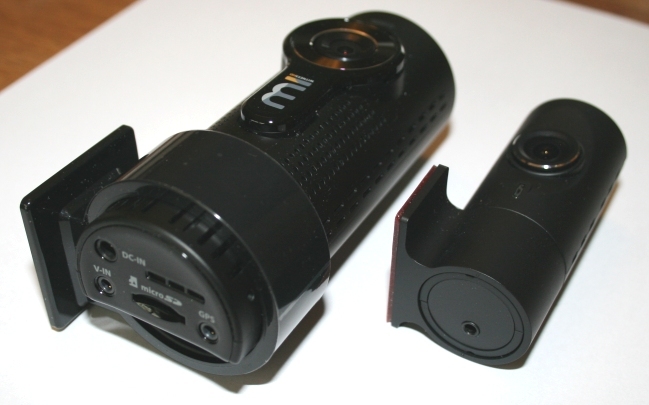 Users will also be pleased to know that the manual for the MI Witness does not stall at the dash cam itself, it provides details on how to use both the desktop software which allows the reviewing of captured video footage and mapping detail – but also has screenshots and operation guides on the smartphone apps used to configure the parameters and watch the field of view. Many owners will appreciate this level of detail. Fitting both the cameras took me around 10 minutes – I used the lighter socket connection rather than the hardwire kit as this is a review only, nonetheless I had the camera running and was driving and using it in a very short space of time. Although it should be mentioned that I did not hide the cables behind the internal fittings, I simply ran it across the top of the car doors internally, threading it through the passenger grips and seat belt guides as a temporary solution. When the ignition is turned on, there is a short delay followed by a “beep” sound as the camera boots itself into automatic record mode. About 15 seconds after turning the car on, the camera is recording and a blue LED indicates that all is well. In terms of the size of the front camera, it is “fairly” large. I say fairly because there are indeed smaller cameras out there, especially the little cheap nasty ones, however despite its size it should quite easily fit into position behind the mirrors of most vehicles and therefore stay out of the vision field of the driver. Irrespective of whether or not it slots neatly into position there however, is the more important consideration as to whether or not the lens has a clear line of sight through the wiper swept area of the windscreen. There is little point demanding it sits behind the mirror if the wiper does not clean that area. 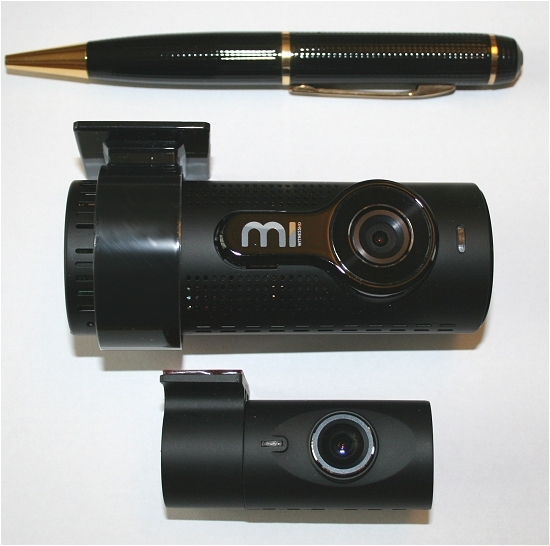 Here is an image showing the size of both front and rear dash cams next to a chunky style ball point pen. So not tiny, but not too bulky as to be off putting by any means. The actual dimensions of the units are as follows should you need them. There is no internal battery in this kit, it cannot be removed from the vehicle and used to take photographs or video around the scene of an accident. It powers down using a super capacitor which is built in. Personally I do not see this as a down side, as I am more than aware that Lithium Ion batteries used by the producers of many car cameras are pretty much defunct after a few months of use anyway, lasting only seconds – just long enough to power down as they simply cannot retain a charge. This can cause disappointment with the buyer, as they are often not aware of this deficiency in the item they have purchased and are often told that they have around 30 minutes of power even when the camera is not connected. This is therefore not strictly true, and is more a marketing ploy than a feature with substantial longevity. Additionally, such designs often do not facilitate the replacement of the battery and again, this is generally a point which is not highlighted with potential buyers during the sales process or within product descriptions. Neither camera has the facility to connect directly to a computer of any type via a standard USB 2.0 connection (or later version). In order to transfer video to a compatible machine with the player software installed, another method must be selected. There are a couple of ways of getting footage onto a PC, either via a USB/Micro SD card reader. These are cheap and cheerful costing just a few pounds and are available at any half decent PC supplier. This is the method I used. It is a matter of removing the card from the slot in the camera and inserting it into the card reader, which in turn is then plugged into a spare USB port. I am on windows which detects the presence of the card and displays the contents in the same way as it would your hard drive under windows explorer or file explorer depending on which version you run. Another way of moving the videos from one location to another would be to use the supplied adapter which converts the Micro SD card into the standard sized SD card, a size which is more popular with PC manufacturers who often build the card slots into the casing and motherboards. Once the memory is accessible to the PC, the software player can step through the videos, GPS files and events store playing the movies and displaying maps on the screen at the same time. A screen shot of this software running is shown below. Now lets take a quick look at some of the video produced by the camera. We have four videos to show – two pairs, the first pair of videos are the two cameras running at the same time during the day. Allow the video to play – and please select the little cog icon in the bottom right once it is playing so that you watch in 720p HD – this is imperative for the best performance to display the capability of the camera. 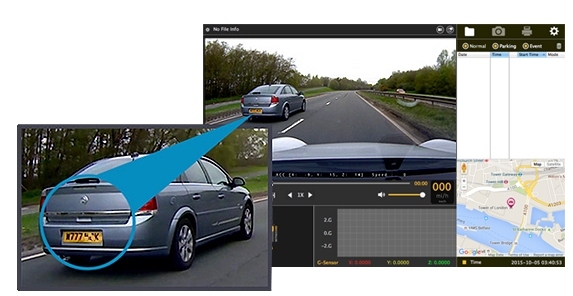 The second video below shows the rear view dash cam in action – it shows what is going on behind the vehicle in step with the video above. The sample below is the front facing night time view driving through a moderately lit village at night. You can see registration plates as the car approaches the one in front which has stopped. And the final shot below is the camera in the back of the car, recording video at the same time as the forward facing cam which produced the movie above. Once again, please choose to up the resolution using the icon at the bottom right hand corner in order to this excellent camera the justice it deserves! I hope you have gained the information you required by reading this review – if you have, please pass on the information to your friends! We appreciate it!! No Options - Just full kit. - Minor - menu voiceover a little rough - but audible.